Each configured Deviation is analysed separately for each Node. Check out our Deviations Manager guide. You can navigate through the Deviations via the left and right arrows (‘<‘ or ‘>’) or via the drop-down menu. Status – The status of the Action, either Open (in progress) or Closed (completed). Click the ‘+’ button to add a new row. A dialog box allows you to enter the information. If the Deviation is deemed to either have “no Causes” or to be “Not Applicable” then checking the relevant box will deem the Deviation as Assessed. PHA Comp keeps a record of which Deviations in a Node have been assessed to assist with conducting a study. 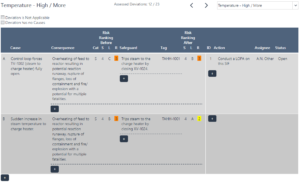 A Deviation is considered to have been Assessed when at least one Cause and Consequence has been entered or either the “Deviation is Not Applicable” or “Deviation has no Causes” check box has been selected. 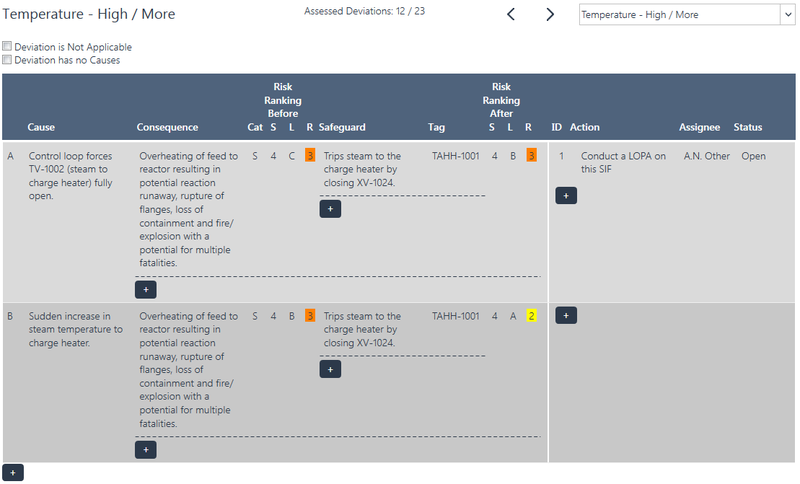 The Assessed count is displayed on the Node Overview screen and the Deviations screen.